Mary Kom was born on March 01, 1983 in Kangthai, in Chuddchanpur district of Manipur. His full name is Mangte Chugueniz Mary Kom, but she is famous as Magnificent Mary or just Mary Kom. 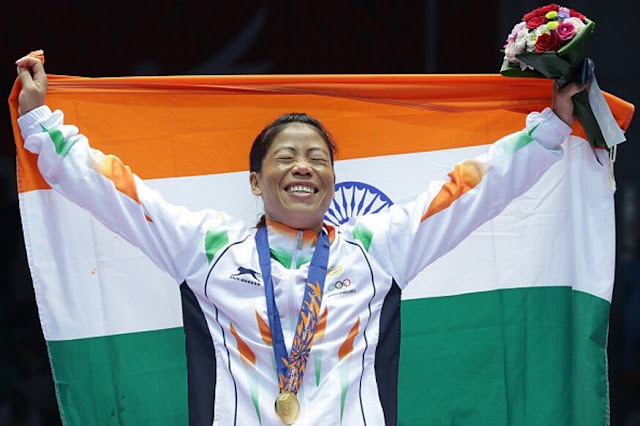 He is the first Indian boxer from the North East tribe, he is also the only female boxer who has won medals in five international championships. Her father Mangta Tampa Kom and Mata Mangte used to cultivate for leave life. After getting an education in various schools, he got a bachelor's degree from the college of his own district. Mary Kom was interested in athletics from the beginning, but the success of Mary Kom has inspired by Dingko Singh. He is the Manipur State Boxing Coach Start the practice of boxing in the direction of George Singh. Their practice continued on the Khuman lamps place of Imphal. Boxing was not considered good for girls, for this reason Mary Kom had to hide the family for a long time about her game. When Manipur won the state boxing championship in 2000 and his picture appeared in the newspaper, only father and other family members came to know that daughter is a boxer. Meanwhile, their marriage. Annular com and twin sons were born. His international career first started with participating in the EivVimans World Boxing Championships. In this competition held in the US (2001), silver medal won a 48 kg category. Gold medal in the 45 kg category organized in Turkey in 2002. Gold Medal in Asian Women's Boxing held in India in 2003 After this, he won a gold medal in Norway, Taiwan and Russia. Gold Women Box Cup in Venus Denmark was a gap two years after the birth of children and in 2008, the silver medal was awarded to Avi Boxing championship in India. In 2012, for the first time female boxing took place, Mary Com took part and won the bronze medal. He hoisted Indian trials at the conclusion of the Summer Olympics in London. Manipur government gave him 50 lakh rupees and 2 acres of land in the reward. The list of medals won by Mary Com during the boxing period of 2001-2012 is very long. Internationally, 18 medals, first in 14, 3 in the second and 1 in 3. He is credited with winning 10 medals at the national level. Apart from the Government of Manipur, Rajasthan, Assam, Arunachal Pradesh governments have also given prize money for its achievements. 10 lakh rupees from the Ministry of Tribal Affairs and 4 million rupees from the North Eastern Council.